A family tradition that Kelly makes every New Years Day for good luck. The recipe is mildly spicy and makes a full bowl for approximately 3 people. Directions: Rinse and drain the black eyed peas. Put enough water in a stock pot to cover them by a little more than 1″. Bring to a true boil. Add the peas to the water and let come back to a boil, then immediately reduce heat to a simmer for 10-15 minutes. The peas should be mostly tender when done with this part of the process. Do not add salt to the water before or during this part of the process. Drain water from the pot (can pour though a colander). Put the peas back in the pot and add chicken broth, water, Rotel tomatoes and dry seasonings per the amounts listed above. Bring to a slow boil for 5 minutes. Meanwhile, fry bacon strips until crispy, remove and let cool. Sauté onions, garlic and peppers in bacon grease until tender. Add to peas in the stock pot. Crumble bacon and add to peas. 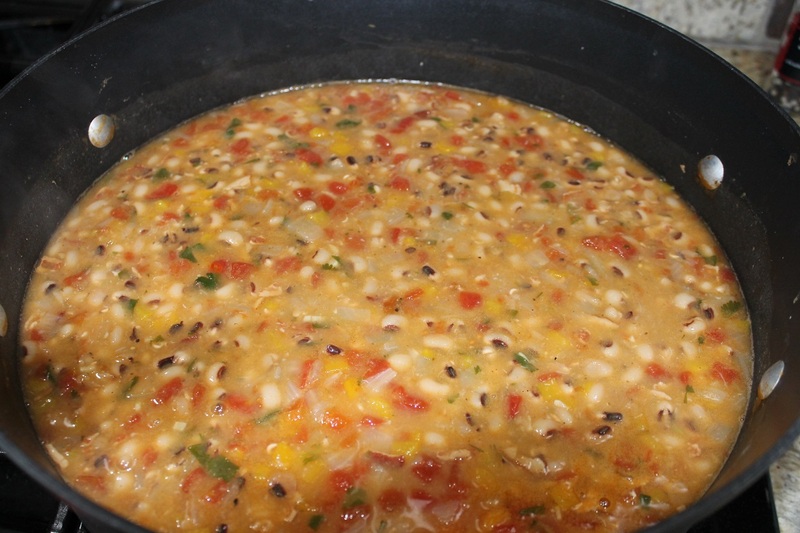 Reduce heat and let simmer for 2 + hours, checking for tenderness every 30 minutes. Add fresh cilantro about 5 minutes before serving. You may need to add more chicken broth or water if more liquid is needed due to evaporation. If you want to make it more spicy, you can add 1 small fresh chopped jalapeno and/or a small can of green chilies. Remember that the Creole Seasoning has red pepper in it and the Rotel has some kick to it. This recipe is easily doubled or tripled and can also be done in a crock pot. If at all possible, use fresh black eyed peas, which are available in the produce section of the grocery store after Christmas. If you must use dried black eyed peas, first soak them in water following the directions on the package.